Cryptocurrency is the fastest growing trend in technological and financial circles today. Find out what you need to know about cryptocurrencies right now. It is without a doubt that cryptocurrency is the hottest trend in technology as well as financial circles. The application of blockchain technology is finding footholds across the business spectrum with the potential of drastically altering the financial landscape. You may be a skeptic and that’s OK, I was for a very long time. What you can’t do is deny their presence, whether you are a believer or not there are a few things everyone should know about cryptocurrencies. 1.Cryptocurrencies are, and aren’t, like “real” money. Cryptocurrencies are exactly like real money, called fiat currency, in that they are units or tokens of tradable assets that can be used to exchange for goods or services. The value they have is what we give them, they hold that value so long as we trust them. Unlike fiat currency, every digital token can be traced back through the blockchain to the point of it’s existence, every transaction that was ever made with any digital token is a matter of public record, the location of all tokens is known at all times (IDs are always anonymous) and there is no known way to counterfeit them. Real currency, fiat dollars, is very hard to control. Central banks only have a rough idea of how many dollars or euros or yen or pesos are in existence, there is no way to know where they all are, if some get lost or damaged there is no way to know and it’s easy to slip counterfeit bills into the system. Add to that the infinite ways of defrauding the system and you can see why digital assets are gaining market trust. 2. There is a major shift underway. A shift in money. All the money in the world is slowly moving into digital assets. It may not happen this year, or even in our lifetime, but eventually all “money” will be digitized and most likely verified through blockchain technology. 3. It is possible to get free money, or money from nothing. If you haven’t already heard, Bitcoin split into two currencies: Bitcoin and Bitcoin cash. This happened because of a hard split in the blockchain. The split occurred because one group of miners /exchanges wanted to fix a problem one way, another group wanted to fix a different way and the two ways were not compatible. At first analysts feared the split, if it were to happen, may cause Bitcoins to disappear if they were transferred between exchanges following different protocols. What actually happened is that the split went off without a hitch and a new coin was instantly created. Anyone holding Bitcoin before the split held equal amounts of Bitcoin and Bitcoin Cash after the split, free money. Bitcoin cash began trading near $800. An account with 1000 Bitcoins was instantly worth $800,000 more than it was and this type of split could happen again, and with any digital token on the market. 4. The cryptocurrency market is liquid, broad and deep. What I mean by liquid is that it trades around the clock, 24 hours a day, 7 days a week 365 days a year regardless of holidays, natural disasters, astronomical events or alien invasions. You can access from anywhere there is an Internet connection, anywhere in the world and transfer funds instantly across borders and currencies with no hassles, no obstacles and very little in the way of cost. These facts make it a great market for traders, speculators, investors or those who simply want an easier way of handling transactions. 5. The cryptocurrency is anonymous. Paying with cryptocurrencies like Bitcoin is like paying with digital cash: nobody knows where it comes from and who has spent it. With the rise of the data mining industry, we are tracked everywhere starting from our Internet usage to our credit card and other online payment transactions. Using Bitcoin, for example, you can keep all your financial transactions anonymous. Cryptocurrencies are a great solution for a safe online shopping, but how to keep the rest of your Internet activities private and inaccessible to data miners, ISPs, black hats of all variety from hackers to scam marketers looking for a way to collect, steal, cheat or manipulate your data? Using a reliable VPN service is all-important. A VPN connection is nearly impossible for hackers and cyber spies to see, if they can see it – they can’t access it without authentication and if they can evade that the data is encrypted so they can’t even use it. When you make a connection the website won’t know who you are unless you log in or tell it. Basically a VPN makes your connection so much trouble to hack, black hats or any other “legitimate” hackers won’t even bother. 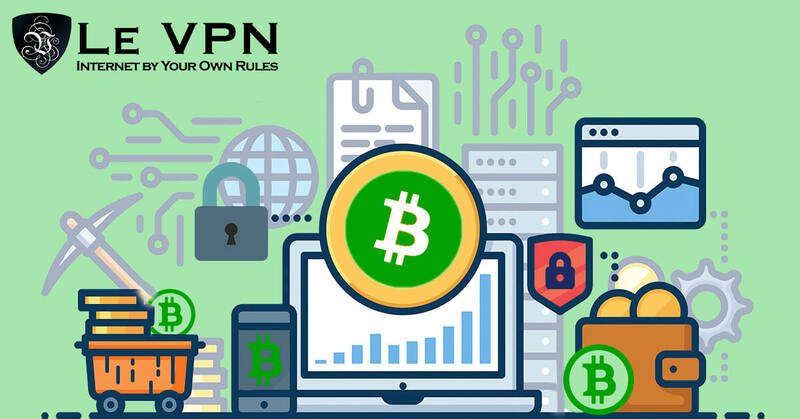 And to keep you even more private and anonymous, you can subscribe to Le VPN who accepts Bitcoin as a payment method for your VPN service. Conclusion: If you want to get into cryptocurrency you need to get Le VPN before you get started. Even better if you use a cryptocurrency like Bitcoin to buy VPN. If you don’t care about cryptocurrencies, you still should get Le VPN to keep you, your family and your business safe. Do it now before its too late.